'What poppy installation means to me' Jump to media player Stage designer Tom Piper talks about the ideas behind the poppy art installation at the Tower of London. Lights out to mark WW1 Jump to media player People across the UK are being asked to switch off their lights between 22:00 BST and 23:00 BST on Monday and to light candles in a mass act of remembrance. Knitted poppies mark WW1 parade Jump to media player A Folkestone resident explained her project to remember World War One with knitted poppies. Lanterns mark WW1 100th anniversary Jump to media player The outbreak of World War One is marked in Jersey with a lantern-lit parade. An art installation to mark the centenary of the start of World War One is being opened on Tuesday. 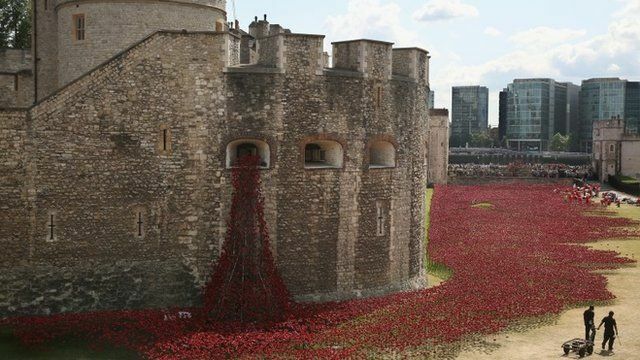 More than 800,000 ceramic poppies are being planted at the Tower of London - cascading out of a window and into the Tower's dry moat - one for each of the British and Colonial soldiers who died in the conflict. The artwork was created by Paul Cummins but put together with the help of the stage designer Tom Piper who told the Today Programme about the ideas behind it. Go to next video: How do you make a ceramic poppy?